Being a specialist in drive technology means we never stop moving. Not only are we constantly optimizing our own processes, but we also offer a comprehensive range of services to you for the entire value creation chain – from engineering and selection all the way to startup and maintenance. What is electrical drive technology? Electrical drive technology converts electrical energy from the power supply system or from a battery into mechanical energy and transmits the resulting force into motion. Many applications that make our daily lives easier – like lifts, escalators, gate drives, washing machines, mixers, electric razors, etc. – would be unthinkable without electric drives. We can find them in both the megawatt sector in applications such as locomotives and in the microwatt sector, in wristwatches, for instance. Electrical drive technology is also now indispensable in industrial production. There, it plays a key role in machines and plants for production and logistics processes. All in all, we can assume that electrical drive technology consumes the predominant share of our overall electrical energy. The driving force in machines has been the electric motor from the very start of electrical drive technology. More and more components have come into play along the path toward modern plant and automation technology. A gear unit downstream from the motor performs the role of a mechanical converter: The gear unit uses its gearing to change the constant speed supplied by the electric motor and its torque to the required levels based on the requirements for the machine or system to be driven. The electric motor is usually an AC motor. In gearmotors, the electric motor and gear unit components form a compact unit. The requirements placed on electrical drive technology increase alongside the complexity of the plant technology. Most processes also need the speed to be controllable as well as converted. To do so, a frequency inverter can be employed, which is located upstream from the electric motor and converts the frequency and amplitude supplied by the power supply system so that the rotational speed and direction of rotation can be changed. The speed and direction then become controllable variables that can be used to control specific processes in driven machines and conveyor lines. At the same time, however, the portfolio of modern electrical drive technology is far from complete: Nowadays, the boundaries between drive technology and automation are fluid. Brakesprovide more safety by preventing movements in the system when the drive is inactive. Motor-mounted encodersconstantly determine the predominant characteristic values of the movement produced, including the speed, torque, and current position. Depending on the complexity of the system and its requirements, suitably powerful electronics and control technologyand software control the processes. Thanks to our practical modular system, the gear units, motors and gearmotors provided by SEW‑EURODRIVE are available in a large number of sizes and millions of combinations. They are also optionally available in a stainless steel housing or explosion protection design. In combination with our frequency inverters (URL), which range from basic to programmable versions, you get the optimum custom drive solution for meeting your individual requirements. Under the extremely harsh conditions of heavy industry and with required torques of up to 4000 kNm, our powerhouses – the industrial gear unit – can do all the hard work. These large gear units are extremely robust and master difficult tasks with maximum reliability. Decentralized drive technology and mechatronic drive systems are becoming more and more important. And whether you would prefer to house your frequency inverter close to the gearmotor in the field or use a gearmotor with an integrated frequency inverter directly: We provide a large range of versions for you. If you need speed, power, and precision, our extremely powerful servo gear units and servomotors are the right choice for you. 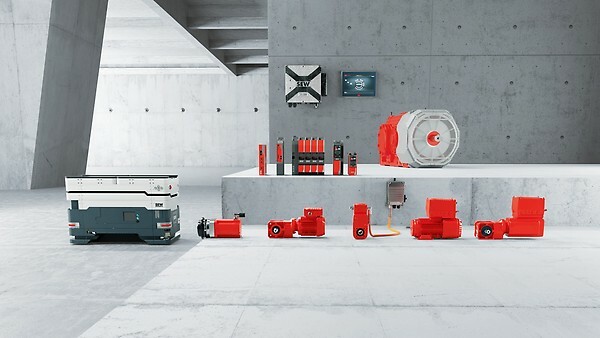 Combined with suitably intelligent frequency inverters you can handle even complex multiple-axis applications and synchronized processes with high efficiency. Depending on the plant architecture and machine requirements, you cannot do without tailored control technology . With that in mind, we have extended our product portfolio with devices for industrial communication as well as controllers, operator panels, software, and other accessories. The issue of safety technology is also now vital in modern electrical drive technology. Increasing staff safety requirements and the need to increase productivity require particularly flexible and reliable safety solutions. Put your trust in our functional safety range and ensure maximum operational safety in constant compliance with the latest applicable regulations.